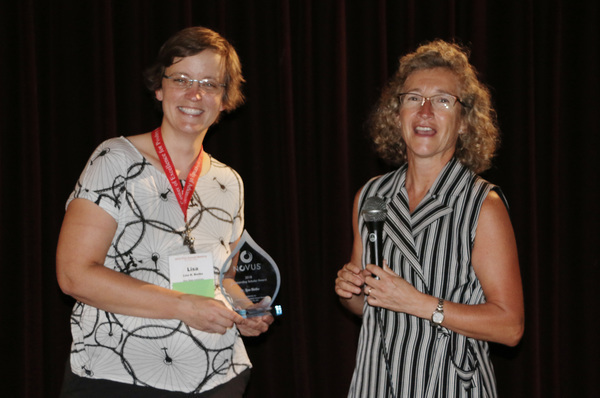 SAN ANTONIO (August 2, 2018) – Novus International, Inc. announced that Dr. Lisa R. Bielke, professor of animal sciences at Ohio State University was recognized as the 2018 Novus Outstanding Scholar at the Poultry Science Association annual meeting. This prestigious award is given to an individual who serves as an exemplary scholar in her area of expertise who has made significant contributions to the industry through her work. The selection is organized by Novus’s industry-leading research and development and technical service teams. As a faculty member of Ohio State University, Bielke focuses her current research on poultry health with emphasis on enteric diseases and the ante mortem control of food pathogens, including projects developing vaccine technologies, probiotics and creating tools and assays to better assess gastrointestinal challenges. Bielke’s research collaborations have resulted in numerous commercial vaccines for hard-to-treat diseases such as Salmonella, Camplyobacter, Eimeria, avian influenza and necrotic enteritis. Many of these vaccines were developed for delivery orally, making them more accessible to broiler and turkey production.